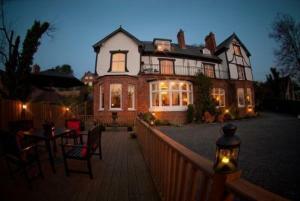 Choose from 59 hotels and guest houses in Northern Ireland. Shown below a just a selection of the hotels available. To search within an area please use the menu on the right. The award-winning Strand House is located beside 2 superb golf courses and a flat sandy beach. The guest house offers a range of organic and locally sourced produce. On arrival, you can enjoy a pot of tea or coffee and freshly baked scones. The spacious and well-appointed en suite bedrooms have wireless internet, a DVD player and a flat-screen TV. Accommodation is spacious, with a large residents' lounge downstairs and a smaller library-lounge with sea views. Cairn Bay Lodge is in extensive gardens overlooking Ballyholme Beach. 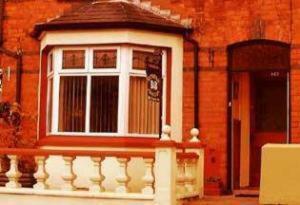 The villa is ideal for visits to Belfast and Ards Peninsula. Each en suite bedroom is furnished with antique and modern furnishings. Rooms have beach or garden views, as well as flat-screen TVs, iPod docks and free Wi-Fi. There is a gift shop and a salon offering beauty treatments. A locally-sourced gourmet breakfast is served in the oak-panelled dining room. 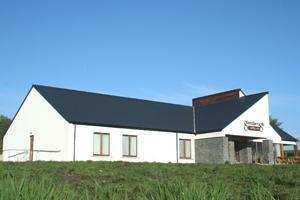 Cairn Bay Lodge was named 'Guesthouse of the Year' in 2006 and 2007 by NI Tourism. 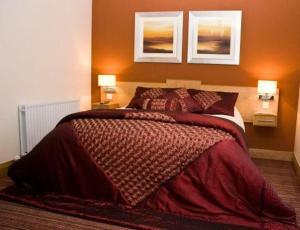 The Ramada Hotel Portrush is situated in the centre of Portrush close to the bustling Harbour. Welcome to the Ramada Portrush, overlooking the Atlantic Ocean, on the landmark site of the former Northern Counties Hotel. Staff are on hand 24 hours a day, offering a warm welcome and professional, friendly service with a real commitment to ensure that you enjoy your stay with us. Join us in the Counties Cafe Bar & Restaurant next morning for breakfast. The Counties Cafe Bar & Restaurant is a totally new concept for Portrush. The town centre location is the perfect venue to meet with friends for a drink or coffee in contemporary surroundings with an unrivalled ambience. 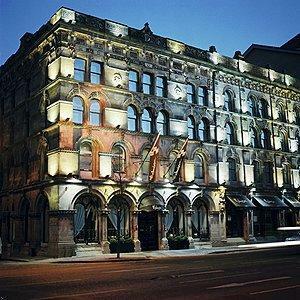 Located in Belfast's Cathedral Quarter, this stylish hotel is in the heart the city centre, at St. Anne's Square. 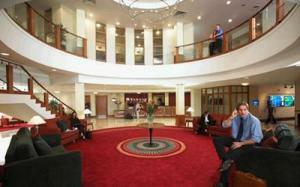 Ramada Encore Belfast has bright en suite rooms, SQ Bar and Grill, and free Wi-Fi in public areas. 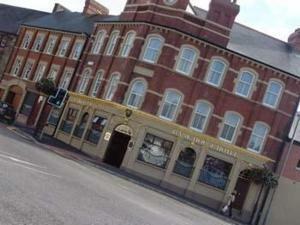 The Hub Bar and Lounge serves food and drink in an informal, friendly atmosphere. There are 3 modern meeting rooms. The hotel is just off the M2, 3 miles (4.8 km) from George Best City Airport and 17 miles (27.4 km) from Belfast International Airport. 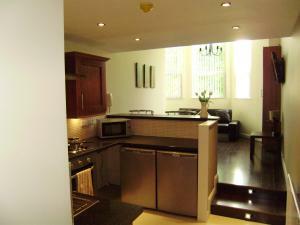 Each room has a power shower, a state-of-the-art flat-screen TV, and broadband internet access (at an additional cost). 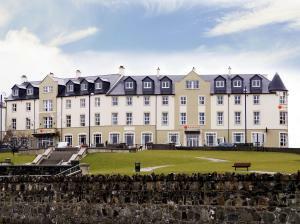 Newly opened in 2007, the family-run Adelphi Portrush is like a luxury boutique hotel with a difference, ideally situated in the heart of Portrush, with views towards Scotland. Adelphi Portrush is ideally placed to allow you to enjoy the world famous Causeway Coast. All of the rooms are individually designed with luxury as standard and all have plenty of character - they are not just the typical box rooms common to the larger chains. Unique to the area, the hotel has a large health suite with sauna, spa and steam room. This perfectly complements the professional beauty and massage therapy offered in the on-site salon. The bistro restaurant serves freshly prepared quality local food in tasteful surroundings. In one of Belfast's most sought-after addresses, these bright, spacious and modern luxury apartments have free Wi-Fi, fully equipped kitchens and high definition flat-screen TVs with Freeview. In the beautiful tree-lined Eglantine Avenue, within easy reach of the centre of Belfast, Brookhill Serviced Apartments are located between the leafy suburbs of the Malone Road and the Lisburn Road. The area is one of the citys up-and-coming hotspots for fine dining and boutique shopping. Each luxurious 4-star apartment is decorated to a very high standard and has a fully equipped kitchen, a main bathroom with a shower and bath and a large, bright lounge with a flat-screen TV with Freeview digital channels. Every apartment has a double bedroom with a workstation, with 2-bedroom apartments also available. The kitchens have fridge/freezers, dishwashers, ovens, hobs, kettles, toasters, microwaves and crockery, cutlery and utensils. A great-value alternative to a traditional hotel, Brookhill offers freedom, independence and convenience. Rayanne House is an award winning country house and restaurant, located just 2.5 Miles from Belfast City Airport, yet in a quite country setting. The proprietors Connor and Bernie McClelland extend a very personal, warm Irish welcome to all of their visitors. The house, an elegant detached residence only 5 miles from Belfast City Centre, full of charm and interest, is situated close to Holywood Golf Club and dates back to the late 19th Century. Built by John McMaster, a prominent builder of many public buildings including Belfast Castle. The award winning restaurant at Rayanne has achieved international acclaim for the high standard of its cuisine and service ranking it among the top in Northern Ireland and listed in many good food guides. Special emphasis is placed on the use of fresh local produce with herbs and spices on a regularly changing menu (reservation required). The tranquil atmosphere of the elegant dining room with its welcome fire and views over the garden to Belfast Lough make it the ideal setting to relax and enjoy a memorable dinner. Perhaps you may require a private venue for a business/personal lunch or dinner, small conference or wedding? Rayanne House has private parking, fax/video facilities, a reception room and meeting rooms with the added culinary skills and expertise to provide your catering requirements from award winning breakfast, light lunch or gourmet dinner. This modern, architecturally striking hotel is situated in Belfast's central, regenerated urban area and offers stylish, contemporary facilities. The spacious, fully-equipped rooms include free broadband internet; making them the ideal place to relax or continue your working day in comfort. Gaze from the window as the sophisticated lighting plays upon the artistic out-door water feature, as you enjoy a freshly prepared meal in the Italian restaurant, or a quiet drink in the open plan bar. Gym membership is available for the health conscious; and for businesses or groups the hotel has 5 state-of-the-art conference rooms to suit any occasion. One of the most-comfortable hotels in Northern Ireland, the Comfort Hotel Antrim offers 40 well-presented en suite bedrooms and excellent conference and banqueting facilities. Situated at junction 1 of the main M22 motorway, the hotel offers easy access to all areas of Northern Ireland including the Causeway Coast where you can find the Giant's Causeway, Bushmills Distillery, Carrick-a-rede Rope Bridge and many more exciting attractions. Belfast city centre is a 20 minute drive away. Beautifully situated on the seafront at Bangor, County Down, this hotel has superb views over Belfast Lough, with Bangor Marina in the foreground. Only 15 minutes from Belfast City Airport and directly linked by rail to both Londonderry and Dublin, the Marine Court provides a perfect base for your stay. The hotel is also well situated at the gateway to the picturesque Coast of Down, with its superb golf courses, country houses and Irish pubs. As a guest at Marine Court Hotel you are welcome to use the luxurious health and fitness club, Oceanis. Plunge into 18 metres of clear blue water, relax in the steam room, unwind in the therapeutic whirlpool or have a vigorous workout in the fully carpeted and mirrored gym. Please be aware that the hotel can be noisy at weekends due to the night club. The 4-star Clandeboye Lodge offers guests a chance to unwind in a tranquil location, yet is only 15 minutes from Belfast city and close to the seaside town of Bangor. 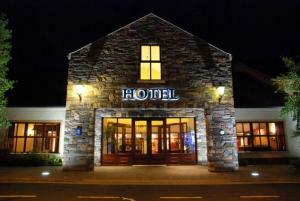 The hotel is perfect for both business and leisure trips. With its tranquil location adjacent to the historic Clandeboye Estate and sweeping fairways of Blackwood Golf Centre, the Clandeboye Lodge Hotel is the ideal venue for leisure and corporate visits, conferences, seminars and banquets. Following the recent completion of a refurbishment programme, the hotel offers 43 superior and executive rooms in 3 contemporary designs with all the services you expect from a deluxe hotel such as free wireless internet access, personalised voicemail, satellite TV shown on the latest LCD wide screen TVs, in-room ironing centre, extensive dining options for a relaxing night in, express check-out service and complimentary access to a dedicated business suite. All rooms enjoy scenic views over parklands and meticulously landscaped gardens with designer sculptures. With 8 meeting rooms located within a dedicated conference centre and complimentary access to a business centre, The Clandeboye Lodge is the ideal venue for all your business needs for meetings from 2 to 450 delegates with ample free car parking.